Our Glitter Butterfly Magic Pull Bows make the perfect bow every time. All bows are packed flat in a box. Available in a Red, Gold and Silver in three great sizes. 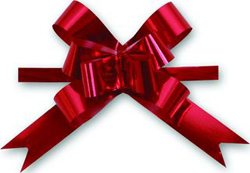 Bows come with banding ribbon which can be used to tie around the package. Perfect for any gift item!